PASADENA, Calif. — Someone is standing up to television's Goliath, with a prominent competitor saying Monday that Netflix is deceiving the public about what is a hit and what isn't. 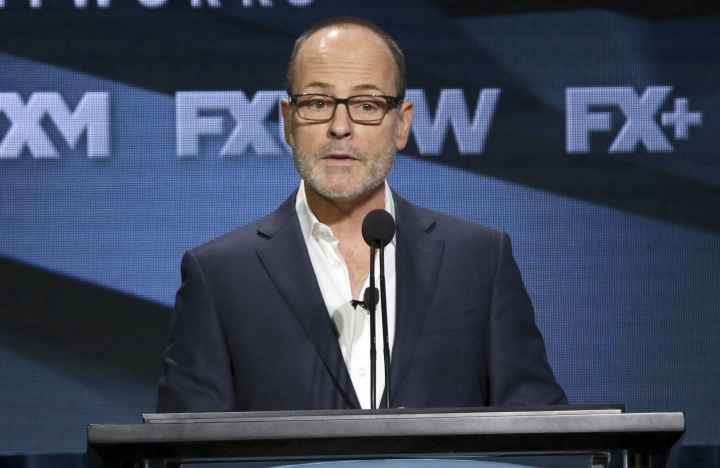 John Landgraf, the FX Networks chief executive who has frequently pointed out the glut of scripted TV, said Netflix is using cloudy measurements to claim increasing dominance among viewers. It's an approach he said reflects a worrisome Silicon Valley arrogance. Applying long-used industry standards to Netflix, "their true batting average would be viewed as unimpressive," Landgraf said. The streaming service has upended the TV industry with a gusher of programming beyond that of any other outlet. This year, Netflix also realized its goal of earning a best-picture Oscar nomination, for the film "Roma." But success doesn't necessarily stem from an "endless money cannon," as Landgraf described spending by what he called Silicon Valley's "monopolistic titans." Netflix's claim that 40 million households globally watched the series "You" is suspect, Landgraf said, contending the U.S figure would be only 8 million viewers if the industry's average-viewership standard was applied. The streaming service generally refuses to release viewership numbers, emphasizing the subscriber growth it now pegs at more than 130 million worldwide, with nearly 60 million of those in the United States. "By creating a myth that they have used data to find the magic bullet of guaranteed commercial success that has eluded everyone else since the creation of television, they have given the impression that the vast majority of shows on their platform is working ... and that they have or will soon have many more hits than anyone else," Landgraf said. Netflix declined comment Monday. The company said in an earnings letter it counts a viewer if they "substantially complete at least one episode." Landgraf, who dismissed that measure as meaningless, said a program like "Stranger Things" is rightly cited by Netflix as an audience "home run" but called it an outlier. FX is coming off a good year, with a wealth of Emmy and other awards for shows including "The Americans" and "The Assassination of Gianni Versace: American Crime Story." Landgraf said he's optimistic about FX's future as Walt Disney Co. prepares to acquire 21st Century Fox, parent company of the channel. Netflix puts its money where its mouth is: In 2018, the streaming platform said it was spending $8 billion on programming, the vast majority of it original. Since 2014, programming from Netflix and other, less robust streamers has increased nearly 400 percent, compared to a 1 percent drop for broadcast and a 32 percent increase for pay cable, according to FX research. Volume doesn't guarantee quality, no matter what Netflix's message may be, Landgraf said in a Q&A with critics that was part of FX's promotion of upcoming and returning series, including "Better Things" and "Legion." "The flip side of taking hundreds of at-bats is you're going to get a massive number of strikeouts. So naturally, Netflix made and launched a number of consumer failures," he said. "But by reporting singles as if they were home runs, and failing to ever report a single strikeout, they undercut" their claims. An outlet's performance can only be verified by agreed-upon, consistent measurements such as those compiled and analyzed by Nielsen, he said, noting the company is measuring Netflix and is adding Hulu and Amazon this year. While some ratings for top-rated broadcast and cable shows are released publicly with network agreement, Nielsen has yet to do the same for Netflix. "One way or another, the truth will ultimately come out, as it always does," said Landgraf, who maintained his customary even, somewhat professorial tone throughout his Netflix dissection. He called on critics to resist reporting what he called "cherry-picked data" and to wait for third-party measurements. He also asked the room to consider the issue in the larger context of journalism and the forces that the digital industry that encompasses Netflix has unleashed. "It's just not a good thing for society when one entity or one person gets to unilaterally make the rules or pronounce the truth," he said.